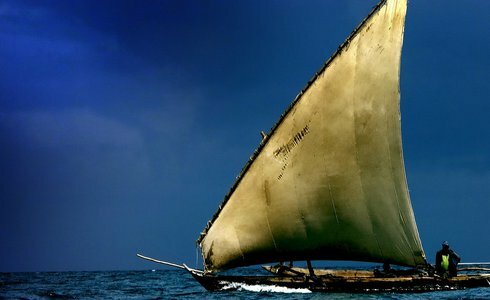 A Traditional Dhow Sunset cruise, exploring the beautiful coastline of Stone Town on the island Zanzibar. The best way to experience the glorious Zanzibar sunset. Step onto the deck, relax and sail away on a magical sunset cruise to end your day. The sunset cruise leaves in the late afternoon from in front of the Zanzibar Serena Inn and cruises along the Zanzibar (Unguja) coast, slicing through the clear turquoise water. The hustle and bustle of busy people in Stone Town grow faint in the distance until they seem only a memory.Music takes over, the butler serves canapéas and keeps your glass topped up with your choice of beers, wine, cocktails or sodas, encouraging you to sink back into the cushions and enjoy the romance of Africa while watching the scenery drift by. The sun sets, changing the sky from shades of pinks and blues to magnificent golden colours as you sail back towards the glimmering lights of Stone Town in the distance with the wind gently blowing you back to shore.